Brisbane mental health service providers are concerned the transition to the disability-focused National Disability Insurance Scheme (NDIS) may leave some mental health workers and their clients feeling insufficiently supported. The National Disability Insurance Scheme began rolling out across greater Brisbane, Logan, Redlands and Gold Coast local government areas in July 2018, and will replace the previous Queensland Government funded services. The scheme combines the previously separate systems of physical disability and psychosocial disability (which caters to individuals whose mental health impacts on their ability to function in society) under one national framework. National Disability Insurance Agency assistant director of community and mainstream engagement, Zoe Gill, said there was a learning curve that came with the integration of previously separate systems now working in the same space. “Traditionally disability and mental health have been siloed systems and the NDIS forces them to work together to achieve outcomes for a person living with severe, permanent and lifelong psychosocial disability,” Ms Gill said. “But this has meant that the NDIS has had to drastically improve how it interrelates with the mental health sector… and our staff are still certainly learning,” she said. Ms Gill said the changes were not always welcomed by mental health workers. “I think mental health workers have had to really dig in and learn, and have somewhat felt forced to play in the disability sector,” she said. Under section 24 of the NDIS act, an impairment must be “likely to be permanent” and result in “substantially reduced functional capacity” in order to be eligible to receive support. 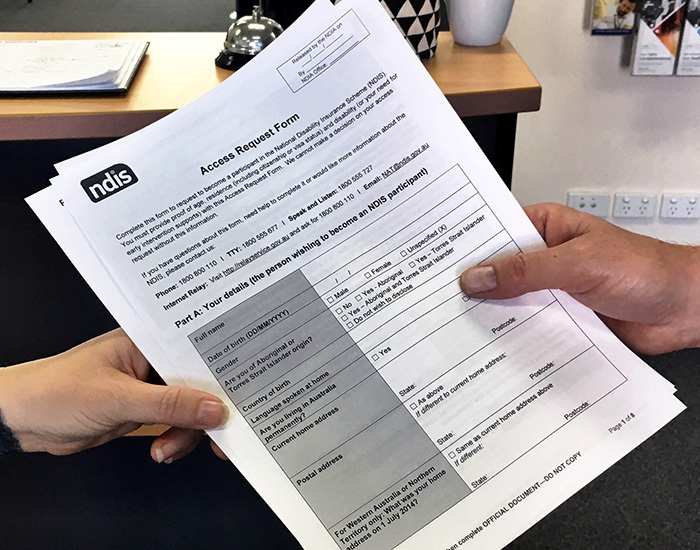 “As existing services are closed or absorbed into the NDIS, people who don’t meet this criteria could be left temporarily without needed supports,” Ms Gill said. “A lot of federal services were rolled into the NDIS, and so there is a new gap created for people living with psychosocial disability, but not dysfunctional enough to meet S24 of the legislation to meet the needs of the NDIS,” she said. Neami Partners in Recovery support facilitator Brooke Mulligan said part of the role of her organisation was to identify gaps in the sector, but she said she hadn’t seen the results of that work reflected in the NDIS. “We were there to identify gaps within the mental health sector, but I don’t know where that’s gone now,” Ms Mulligan said. “We’ve got a lot of people on our books still that do have complex mental health issues, but they’re not deemed, or they don’t have enough evidence to get onto the NDIS,” she said. Ms Mulligan said while her organisation had been working towards the NDIS for years, the transition had still proven to be challenging. “It’s challenging in the fact that, I guess, within the mental health sector we’ve always tried to aim to work with people on a real strengths-based recovery model, and now we’re working within a disability framework to try and get these people ongoing support, it’s really deficit focused,” she said. Large disability support organisation FSG Australia closed all of it’s locations across South East Queensland and NSW on June 30, resulting in a loss of 900 jobs. In a statement made earlier this year, former FSG Australia CEO Vicki Batten said the closure was attributed to the financial investments required to adapt to the NDIS. Personal helper and mentor supporter at Open Minds, and previous FSG Australia employee, Jason Hand, said the NDIS had shifted many organisations’ focus from supporting people to securing finances. “It seems like companies are more calculated with what they do now and seem to be a little bit scared with how to provide services,” Mr Hand said. “It’s not like ‘we’ll do this and this will be great for the person’, it’s more like ‘well, can we get money from that person to do it’, so at the moment it feels like it’s gone more business-like than person centered,” Mr Hand said. He said where some organisations had failed to adapt, others were now benefiting from foresight. “Companies that have prepared well for [the NDIS] seem to be doing really well,” Mr Hand said. “They’re getting a lot of their customers from the companies that weren’t prepared for it, or not prepared as well and lost out, and now all the clientele are going over to those companies that have prepared well for it and have put themselves in a position which is more sustainable long term,” he said. Mr Hand said while there was uncertainty around funding and support at the moment, the NDIS had the potential to create opportunities for more group and community support for service users in the future. “At the moment it feels negative and I think people feel the negative, but I think there’s positives as well that will come out of it,” he said.